The Trainman line Dash 8-40C is as majestic as a modern diesel gets! It has scale dimensions and simplified, but not insignificant detailing. 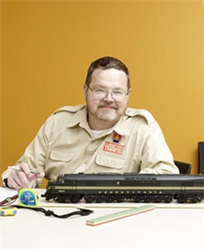 The model comes in both Lionel TrainMaster and conventional versions. Behold the no. 20032007 (TMCC) Union Pacific Atlas O Trainman line Dash 8-40C. The model is offered in conventional ($269.95) and TrainMaster-equipped ($429.95) version. The model requires O-36 diameter curves. The Command-version includes TrainMaster, Improved RailSounds, Cruise Commander speed control, remote couplers, and a smoke unit. The conventional version has operating horn and bell sounds and ditch lights that oscillate the the horn is blown. First, the model looks great. At first glance you'd not even guess that this was the affordable Trainman line. The absence of a lot of see-through detail and fragile add-on fixtures does not take away from the look of the model. Paint and decoration were first rate and the Union Pacific colors were well reproduced. In short, I don't even recall when this was first cataloged, but I think it was worth the wait! For more information see your Atlas O retailer or go to www.atlasrr.com for more information. The Dash 8 has a headlight and ditch lights for visibility when blasting through grade crossings. Note the add-on grab irons on the top of the nose. The Dash 8 speeds past two people watching the trains roll by. The model has plenty of fingertip texture, curves, and squarish corners. The Dash 8 requires O-36 track, and easily snaked through our switches. The TMCC-equipped model has RailSounds, coil couplers and a smoke unit. For a proletarian model, the Trainman Dash 8 has a significant array of screens and detail points (note the depth of the latches) and a significant number of safety and warning tags that once would only have been seen on high-end products. The trucks are well designed and the rear screens look terrific, thanks in part to the dark color contrast with UP yellow. The screen for the radiator wings is see-through. Note the cast-in lift rings and the smoke unit exhaust stack. Looking at the rear of the model, I just thought "Wow." Add-on, fine wire grab irons, sand cap, drawbridge chain, uncoupler arm, and even a brake line hose. What more you you ask for?